Sam, you're doing powdercoat too now? Oh god, after the FB comes back from Classic I just might have to wire every subsequent paycheque directly to ReSpeed... SO many things I want to do! On an off-note, does anyone know someone who repairs rims? I've got a set of 83LE Rims but one of them looks like it had a very tough encounter with a curb and needs some mending. All the material is still there, it's just flattened like crazy. 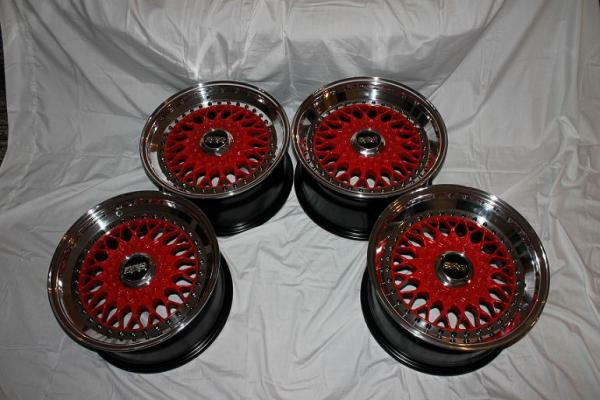 Either that, or does anyone have a single 83LE rim laying around they'd be willing to part with?! Yup and can repair some cracked rims and curb rashes. I do have a guy 2 doors down that specializes in wheel repair, but he charges an arm and a leg sometimes. Just showing off. After 4 months of work they are finally finished. They are not completely perfect as the lips had so much oxidation and pitting that there was only so much I could do to make them look good. As with the cars paint, they will look great from about 6 feet away. The powdercoating was done by my good friend Sam at RE-Speed. After looking at many colour samples and agonizing over it I finally found one that really grabbed me. It's call Bullseye by Prismatic Powders. Actually came out lighter than the sample looked but I was worried the sample might be too dark so it worked out nicely. Black bolts from blackforestindustries.com. Not entirely sure how they'll look on the car, but they will certainly catch some stares. Not bad for my first wheel refurb. Ooo. Purty. I don't think you even have to worry about looking good at 6' or more - most people honestly just don't notice details like that. I've got tire rash on the front bumper of my dd Passat - got turned sideways on the highway in a blizzard and tagged the duallies of a big Dodge Ram - chewed a hole in the bumper near the corner, broke the reflector and driving light. And most people never notice the damage on the car. RX7 get together in van?